According to the survey, conducted between December 15-25 at the fag end of last year in all 543 parliamentary constituencies, the NDA may get 257 seats and the Congress-led UPA (minus SP and BSP) may get 146 seats, far off the magic mark. The survey said on Saturday that key to government formation could lie in the hands of 'others' who may get 140 seats in a House of 543. 'Others' include Samajwadi Party, BSP, AIADMK, Trinamool Congress, Telangana Rashtra Samithi, Biju Janata Dal, YSR Congress Party, Left Front, PDP of Mehbooba Mufti, AIUDF of Badruddin Ajmal, AIMIM of Asaduddin Owaisi, INLD, Aam Aadmi Party, JVM(P), AMMK of Tamil Nadu and independent MPs. 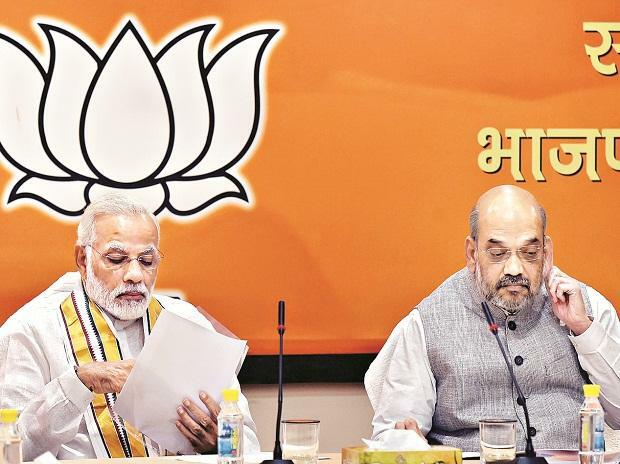 NDA includes the ruling BJP, Shiv Sena, Akali Dal, JD(U), Mizo National Front, Apna Dal, Sikkim Democratic Front, LJP of Ramvilas Paswan, NPP of Meghalaya, INRC of Puducherry, PMK and NDPP of Nagaland. An India TV release said that UPA includes the main opposition Congress, Rashtriya Janata Dal, DMK, TDP, Sharad Pawar's NCP, Devegowda's JD(S), Ajit Singh's RLD, National Conference, RSP, JMM, IUML, Kerala Congress (Mani) and RLSP. The earlier nationwide survey conducted by India TV-CNX in November, before the assembly polls, had given NDA a clear majority with 281 seats, UPA 124, and 'Others' 138. Since then there has been a reduction of 24 seats in NDA and an addition of 22 seats in UPA, says the survey. The survey says that NDA could get 37.15 per cent votes, UPA 29.92 per cent and 'others' 32.93 per cent. Within the NDA, BJP may win 223 seats, Shiv Sena 8, JD(U) 11, Akali Dal 5, LJP 3, PMK 1, NDPP 1, AINRC 1, NPP 1, SDF 1, Apna Dal 1, and MNF 1. The survey said that Congress may win 85 seats (almost double that it won in 2014), DMK 21, Lalu Prasad's RJD 10, NCP 9, JMM 4, JD(S) 4, RLD 2, RLSP 1, RSP 1, IUML 2, TDP 4, JK National Conference 2, and Kerala Congress (M) 1. Among 'others', Mamata Banerjee-led Trinamool Congress could get 26 seats, Samajwadi Party 20, Mayawati's BSP 15, YSR Congress 19, Telangana Rashtra Samithi 16, Biju Janata Dal 13, AIADMK 10, AMMK 4, Left Front 8, Aam Aadmi Party 2, AIUDF 2, PDP 1, JVM (P) 1 and AIMIM 1. State wise break up of seat prediction is: Uttar Pradesh: BJP 40, BSP 15, SP 20, Congress 2, RLD 2, Apna Dal 1; Uttarakhand: BJP 4, Congress 1; Rajasthan: BJP 15, Congress 10; West Bengal: Trinamool Congress 26, BJP 10, Congress 2, Left Front 4; Odisha: Biju Janata Dal 13, BJP 8; Madhya Pradesh: BJP 18, Congress 11; Chhattisgarh: BJP 5, Congress 6; Punjab: Congress 7, Akali Dal 5, AAP 1; Haryana: BJP 8, Congress 2; Bihar: BJP 13, RJD 10, JD(U) 11, Congress 2, LJP 3, RLSP 1; Jharkhand: BJP 7, JMM 4, Congress 2, JVM(P) 1; Gujarat : BJP 24, Congress 2; Himachal Pradesh: BJP 4; Maharashtra: BJP 22, Shiv Sena 8, Congress 9, NCP 9; Goa: BJP 1, Congress 1; Tamil Nadu: DMK 21, AIADMK 10, AMMK 4, Congress 3, PMK 1;A Andhra Pradesh: YSR Congress 19, TDP 4, Congress 2; Telangana: Telangana Rashtra Samithi 16, AIMIM 1; Karnataka: BJP 15, Congress 9, JD(S) 4; Kerala: Congress 8, Left Front 5, IUML 2, BJP 1, KC(M) 1, RSP 1, Independent 2; Jammu & Kashmir: BJP 2, NC 2, Congress 1, PDP 1; Assam: BJP 12, AIUDF 2; Arunachal Pradesh: BJP 2; Mizoram: MNF 1; Manipur: BJP 2; Meghalaya: Congress 1, NPP 1; Tripura: BJP 1, CPI(M) 1; Nagaland: NDPP 1, NPF 1; Sikkim: SDF 1; Delhi: BJP 5, AAP 1, Congress 1; Chandigarh: BJP 1; Andaman & Nicobar: BJP 1; Dadra, Nagar Haveli: BJP1; Daman & Diu: BJP 1; Lakshadweep: Congress 1; Puducherry: INRC 1. According to the release, research and survey agency CNX gave 54,300 respondents structured questionnaire across 543 parliamentary constituencies, covering 1,086 assembly constituencies, with an average of 100 respondents in each Lok Sabha constituency. Those interviewed included 27,832 males and 26,408 females in the age group 18 to 60 years. The survey, the release said, covered both residential and business areas, remote and key localities, including upper middle class colonies. It said that the sample respondents came from all walks of life, including cobblers, tailors, barbers, daily wage labourers, small shopkeepers, mechanics, medical practitioners, auto-taxi drivers and real estate dealers. The next Lok Sabha elections would be held in April-May.